To come across a farm in the midst of the city is akin to panning for gold with cracked lips and discovering a tin of vaseline amongst the wet pebbles. You’re not looking for it, but when it comes to you, you realise it is just what you need. And hindsight makes the experience even more beautiful; what is it doing there??? Just off Hackney Road, nestles just the rural treat. Whilst Hackney City Farm is pretty small (I think I counted two goats, five chickens, a pig, some geese, two calves, a donkey named Larry, three sheep and a cat, although it could have been a stray), there is much wholesome fun to be had! With pigs hanging around in the sun and unbalanced looking ducks (it looks like they don’t have any arms!) dashing about, a three legged cat and a beautiful garden, Hackney City Farm is glorious and makes you forget the big smoke. Don’t go on a Monday as it is closed (even animals need days off) and after hanging with the herd pop into the cafe for a bacon or sausage sandwich (I think it’s made from their pigs – don’t think of Babe) and an ice cream. Perfect if you have youngsters to entertain, want to convince your latest squeeze that you’re a wholesome gentleman, or if you just crave some quality time with the animals, like the middle aged man I caught having a conversation with a goose. 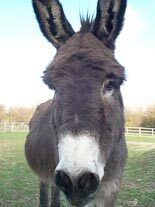 Posted in english literature, Lifestyle, london, review, Uncategorized and tagged amelia murray, donkey, family, hackney city farm, hackney road, london, london attraction. Bookmark the permalink. Whilst there is nothing new about room installations, there’s no doubt that the prospect of a room not made out of the usual mortar and carpet gives us something to write home about. The 2010 Milan Furniture Fair went paper crazy with the “Paperboard Innovation”; a room made out of cardboard including elaborate artwork, lamps, shag rugs, clocks and a dog, made out of the humble material whilst the Lainio Snow Village in Finland allows guests to stay in a room made of ice complete with illuminated frozen art and snow walls. But how about a room made entirely out of wool? Knitted out (ha geddit!) with the latest mod cons, the life sized replica includes a TV, an armchair, a cat and a piano made from hundreds of balls of donated wool which 25 volunteers spent three months putting together. Designed to raise money and the profile of homeless charity, Emmaus, the people from Goodwill Co-op donated their time and efforts to the Brighton project. Emmaus, a charity that offers homeless people work, a home and a chance to rebuild their lives in a supportive environment, relies on donations of furniture and household goods to sell in their shops across the UK. And rather then make a tea cosy or blanket to sell, the volunteers from decided to really pick up their needles and raise their game by stitching together a fabricated living room. Monica Crowe, an Emmaus volunteer told the Argus “It kept growing and growing as we thought of more stuff to fit into a living room”. 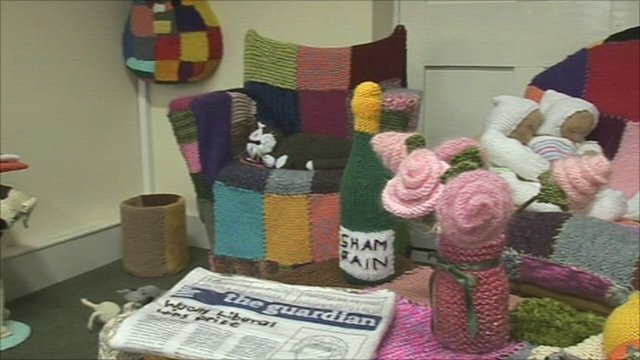 The frames of the knitted furniture were collected from skips and with reduction of landfill being the name of the game, the woolly living room is a novel way to do so as well as raising awareness of Emmaus. If you fancy hanging out in the knitted living room, stroking the knitted cat and playing knitted table football, the room will be on show at the Emmaus Brighton Community Centre from 7th-29th May, as part of the 2011 Brighton Fringe Festival before touring various arts venues and Emmaus communities. And keep an eye out for future projects – a knitted kitchen or bathroom! For more on Emmaus and their projects, see the Emmaus Website. Posted in english literature, Lifestyle, poetry, Uncategorized and tagged amelia murray, brighton, brighton fringe festival, charity, community, emmaus, finland, goodwill, homeless charity, lainio snow village, milan furniture fair, paperboard innovation. Bookmark the permalink.